On 27th March the Ministry of Defence revealed new details for the tracked Infantry Fighting Vehicles acquisition. There will be 210 new vehicles at an estimated cost of CZK 53 billion (USD 2.3 billion). The vehicles will be required to carry 11 soldiers (crew of 3, 2 specialists, 6 troopers), the 30mm cannons also stands confirmed, and it has been decided the vehicles are to be mounted with manned turrets. Four manufacturers were initially invited to submit bids to supply the vehicles: BAE Systems (CV9030CZ), General Dynamics European Land Systems (ASCOD 2), PSM (PUMA) and Rheinmetall Landsysteme (LYNX). Controversies arise around the requirements. The Army requires the vehicles to be well armed and to provide a high level of protection for the crew and transported troops, to carry advanced command and control systems, and to allow for a high potential of further modernization concerning mainly the armament, protection level and technologies used. Before the contract is signed with a potential supplied the vehicle will be practically tested in the Czech Republic to verify its capabilites and parameters, including fires from all types of weapons. An important part of production and servicing is to be assured in conjunction with the VOP CZ – a state owned company that specializes in military equipment engineering, production and development. When we look at these basic requirements presented to the media, there is but one major specification which has been added to the requirements presented on 18th June 2018: the manned turret requirement. Controversies arise, especially because the German PUMA IFV by PSM is fitted with an unmanned turret only. Several experts have already expressed doubts over the new requirement given the Army’s asserted priority was the protection for the crew: the unmanned turrets certainly provide for a better protection for the commander and the gunner seated in the hull rather than directly in the turret. According to Security Magazín, the PSM has already submitted a protest against the last variant of requirements on 5th April. See also: Czech Infantry Fighting Vehicle Tender – manned or unmanned turrets? On the other hand, the manned turrets do have their advantages, and there is also the transport capacity question. The requirement of 11 men is not new. The Army did officially announce it wanted its new IFV to carry 2 specialists and 6 soldiers in June 2018 already. And technically it can be very difficult to provide a vehicle with 11 seats in the hull, and there certainly would be a price (size, protection level, fuel and ammo capacity). The actual Czech mechanized infantry squad carried by the current BVP-2 tracked IFV or the Pandur II wheeled IFV consists of six troopers (commander, two riflemen with BREN or BREN 2 assault rifles, two machine gunners or automatic riflemen with either the Universal Machine Gun Model 1959 or the FN Minimi, AT rifleman with the RPG-7, and marksman with SVD). 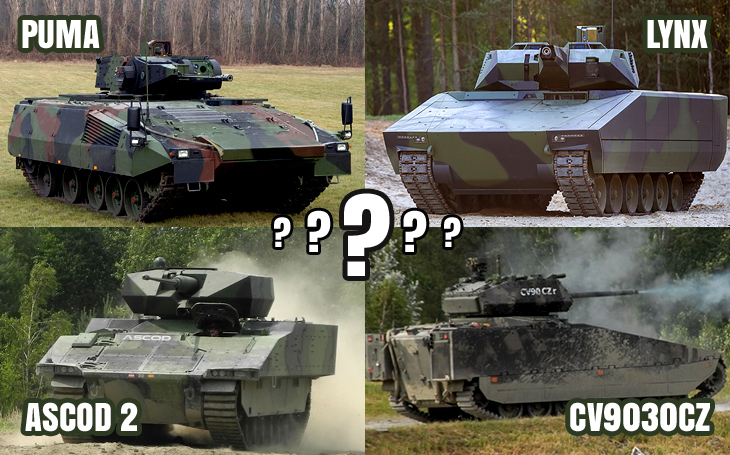 Give us your opinion by voting in our poll: The best new IFV for the Czech Army?